A Helsinki University researcher says Finland's current digital and 'phenomenon-based' learning methods used in schools may not be suitable for all students. File photo of pupils using tablets in classroom. Finland's new digital and phenomenon-based curriculum programmes hinders student learning, according to a new study from Helsinki University. 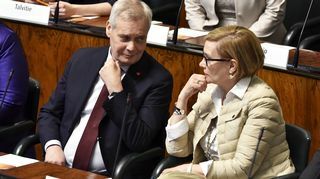 The psychology researcher behind the study, Aino Saarinen, told Yle's Swedish news service that one of the reasons behind the recent decline in Finland's ranking on Pisa education lists is an increase in the use of digital learning materials. The researcher's findings were first reported by Helsingin Sanomat (in Finnish). For some time now - thanks to regular top placement in the international Pisa education rankings - Finland has been touted as having the best education system in the world. And to improve on this, policymakers made the decision to bring digital tools to the forefront of classrooms. "The more that digital tools were used in lessons, the worse learning outcomes were. This was found in all areas of the Pisa measurements," she said, noting that it was not a question of students being unable to use the devices. Instead, she said students can easily be distracted by the devices themselves - like laptops or tablets - and often start using them for something besides schoolwork. Saarinen said the results surprised her, but only to a certain degree. "There have been similar findings from research in other countries. And many parents have said the same thing," she said. Apart from an increase in the use of digital tools, Finland's curriculum in 2016 introduced phenomenon-based learning strategies. This method of learning encourages students to become more active in their studies, to cooperate in study and research groups. The process is quite different from subject-based teaching methods in that students are given more personal responsibility than older, more traditional methods do. This type of learning works for students who perform well in school and receive support from home, according to Saarinen. But less naturally-gifted students face the risk of being left behind in a phenomenon-based learning environment. "Proponents of this method have claimed it would even-out the differences between students with various [academic] backgrounds. But in light of the research it looks like exactly the opposite has happened," Saarinen said. Although Finland remains near the top in Pisa rankings, there have been declines in recent years, and boys have regularly earned overall worse grades in school than girls. The Organisation for Economic Co-operation and Development (OECD) organises a standardised triennial exam that 15-year-olds take in 72 countries and regions. The Pisa test aims to gauge the literary, mathematical and scientific skills of schoolchildren worldwide. Saarinen examined the Pisa results from 2012 and 2015, poring over the test scores of more than 5,000 pupils. She said other risk factors for students include being absent often from school, living in a single-parent, disadvantaged or immigrant household. Phenomenon-based teaching has a particularly negative effect on results in the subjects of mathematics and science, she said. Overall, the researcher is critical about the method of giving students more responsibility for their own educations, saying phenomenon-based learning requires students have strong self-discipline and initiative. They also require students to be independent, focused and flexible. "Far from all 15-year-olds possess those qualities," she said. Although she said her research has led her to the conclusion that Finland's popular, older curriculum gave better results, she doesn't think it's possible for classrooms to return to their digital-free past. "We should still think about when, how and by whom the tools are being used. The use of digital tools should not be the main goal itself," Saarinen said. This story was edited on 20 November, 2018 at 2:07 pm to reflect that Aino Saarinen's findings were first reported by Helsingin Sanomat. This story was updated on 21 November, 2018 at 11.04 am to remove a comparison between teacher-based and digital and phenomenon-based teaching, as it inaccurately suggests that teachers in Finland have not always had broad independence in choosing teaching approaches.